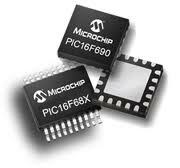 Microchips release of the PIC12F family is ideally suited for low-power and small footprint applications. This family, along with the PIC16F, has an 8-bit CPU that can operate at speeds up to 5 MIPS. Device variants in the PIC12F family have 8 pins (PIC16F variants are offered in 14-pin through 64-pin packages). These are targeted for low cost, low power, space constrained designs that also require sufficient computational power. Some variants in the PIC family have one or more Enhanced Capture Compare PWM Peripheral (ECCP) modules. The ECCP module is optimized for controlling 1/2 bridge or H-bridge motor drive circuits. It can also be used to steer PWM control signals among 4 output pins for BLDC motor commutation or stepper motor control. One feature of the PIC12F family, that isn’t found on all devices in this category of microcontrollers is for the system level debug and development. ICD (In Circuit Debug) is integrated into the chip. No debug header is required, although an optional adapter can be used for MPLAB® support.